Ballads Of Ireland. Here's another batch of songs that were mostly written in America by Irish people who had emigrated there in the late 1900's. Clarkson with music by J.H. Williams. My love and I parted, I left her in tears. But knew not we'd parted, for eye evermore. God's will we may meet, once more in the skies. Ch - So cheer up Irish heroes, etc. Ch-'Tis a fact those dayligh robbers, etc. We Want Freedom In Old Ireland Where Our Shamrock Grows. Written by Jas. E. Larkin, The Irish American and recorded by Mary Harkins of Brooklin New York. Chorus.-Do not give or yield an inch, etc. Chorus.- For expressing their opinion, etc. 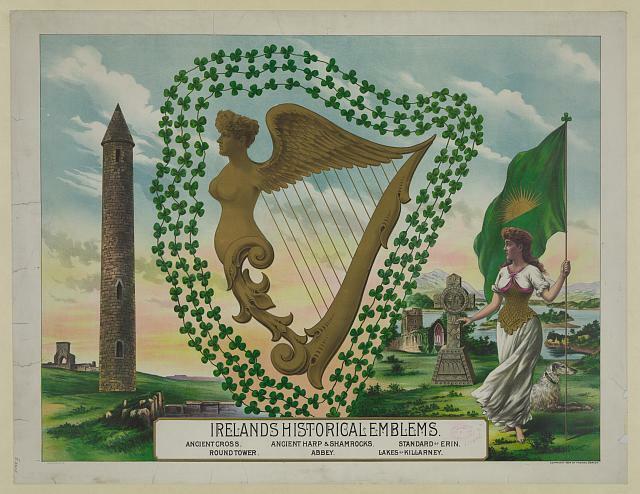 For your freedom in old Ireland, Where our Shamrock grows. For the freedom of old Ireland where the Shamrock grows. Old Folks From Tyrone, popular songs from The Dockstaders. Published by J.W. Pepper in America. Price 35 cents. It's many's a year since we came here, in a ship across the foam. We left behind friends good and kind, and them we'll see no more. With poverty we struggled hard, at last our hearts grew light. In the earth's posey and song. Adding luster to thy fame. In common mass of pleasing beauty.